Paul is very clear to state that just as every part in a physical body plays a unique role, so it is with every member of Papa’s really big family. Since there are trillions of cells in the average human body, there is definitely a unique role for each one of us to play in the Body of Christ. Only in the unity of our faith, will we find the beautiful inter-dependence that our Papa has intended for all of us to enjoy…together. However, if we choose to see the Body of Christ through an organizational lens instead of a relational one, we might risk seeing others as necessary pawns on a chessboard rather than as unique facets of the same diamond. If we choose to base our ‘unity’ on a common vision or church project, we may risk dismissing those in our midst that do not share our particular interests or concerns. Either way, the end result does not produce true unity. We might get the job done, but at what cost? While it seems logical that we would value and appreciate the individuality that we find in each other just like our Papa does, there is something in the orphan mindset that demands conformity. So why do so many of us behave in a way that seems contrary to our Father’s heart? Maybe it is because we are so convinced of our own personal mission that we have a hard time seeing anybody else’s mission as being as important as ours? Maybe it is because we may feel a tad insecure if people are on another bandwagon other than our own? Whatever the reason, if we use any unloving ways to conform people into an image other than the one that their Papa intended (Romans 8:29), we may want to rethink what we are doing. I believe that if we are not secure in who we are, people who are different than us can easily threaten our identity. That is why it is always reassuring when we hang around people who are just like us. I am not saying that there is anything wrong with that because it is common sense that you would associate with people of similar interests, passions and convictions. That is simply how life works. We tend to congregate with people who best reflect what we value. I think that is the reason why we have over 30,000 denominations in the world today. I don’t think this is Papa’s ‘Plan A’ for us, but we are all doing the best we can considering our human limitations and brokenness. While every gathering of believers is a microcosm of our Papa’s intended purpose for His kids, only together will we corporately manifest the splendor and glory of God as Christ’s own Body and His very own Bride. All I am saying is that though people are different from us, we need to be careful not to judge them or dismiss their place in the Body of Christ. If our Father has never ever created the same thing twice, maybe we should give some more thought to each unique work of art that He has created? In Ephesians 2:10, Paul writes that we are God’s masterpiece, created to do the good works that He prepared for us to do before the world began. If everything was created for His pleasure (Revelation 4:11), then obviously there is pleasure to be found in the unique aspects of His nature that can only be discovered when each one of us is simply who He created us to be. I believe that if we truly see each other as our Father sees us, we will not be as quick to judge and disqualify those who are different. I’m not saying that we give way to a New Age kind of tolerance and acceptance that nullifies being faithful to the Scriptures. 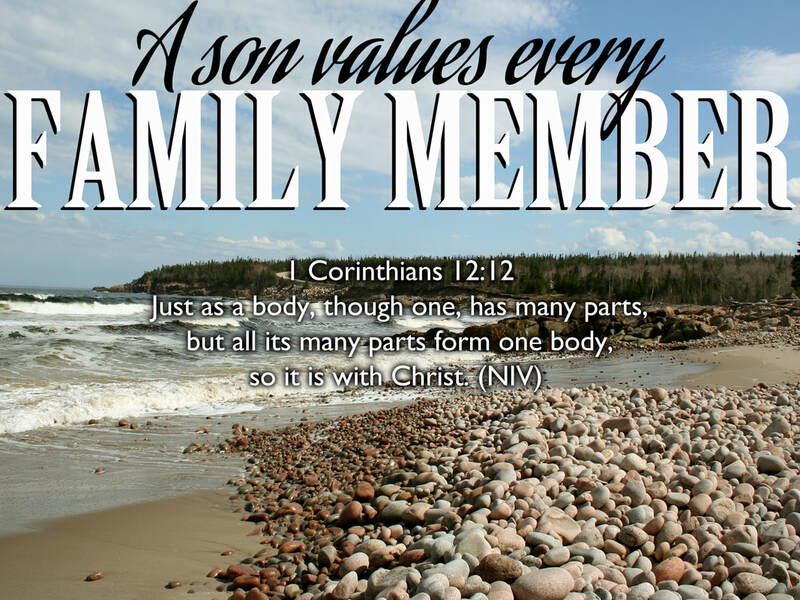 What I am saying is that the more that we see the family of God through our Father’s eyes, we will begin to recognize and celebrate the treasure (2 Corinthians 4:7) that He has placed within each one of His sons and daughters. The older I get, the more I appreciate how much our Heavenly Dad enjoys the uniqueness of all that He has created. Think about it for a second…He has never made the same thing twice! Every strand of DNA, every leaf, every snowflake... all different! There is so much creativity flowing out of His heart that He is always creating something new. If that is how it works in creation, how much more does our Father appreciate the beautiful expression of His image that we all carry? Every strand of DNA… unique. Every cornea, every finger print… one-of-a-kind! Think of it this way… What would life be like if every member of your family was a clone? What if every person had the same physical characteristics, the same personality, the same everything. How boring would that be? Life would be monotonous to say the least. What makes a family a family is the diversity that each person brings… including your eccentric great uncle! In the same way, it is the beautiful mosaic that our Papa has intentionally woven into the Body of Christ that He wants us to celebrate. Our Heavenly Dad loves variety and He absolutely is thrilled with the uniqueness that is found in everything and everybody that He has created. I think it is when we begin to really love, value and honour each other that we will see the fulfillment of Jesus’ prayer in John 17. The tragedy for many sons and daughters though, is that they find it difficult to believe that they are enough the way God made them. The end result is a life spent trying to be a different reflection of the image of their Papa (Ephesians 5:1) than they were intended to be. My prayer today is that each and every one of us would know that we have been uniquely created to reflect the image of our God and Father (Genesis 1:27). There has never been a person in all of history that can shine like you. If you don’t reflect Papa’s authentic image in you, then no one else ever will. My prayer today is that each one of us will feel our Father's affirmation and know that we were created to be a unique expression of His heart. May every form of self-hatred be consumed and destroyed by the ferocious love of God! May we be freed from comparing ourselves with others and learn to simply be the little boy or little girl that God created us to be. I pray that the glorious uniqueness that exists in you would absolutely explode out of you in the coming days! May you have the freedom to boldly display the one-of-a-kind treasure that Papa has deposited in you. And as you come into a greater freedom to simply be yourself, may you also come into a deeper appreciation for each member of Papa’s really BIG family.